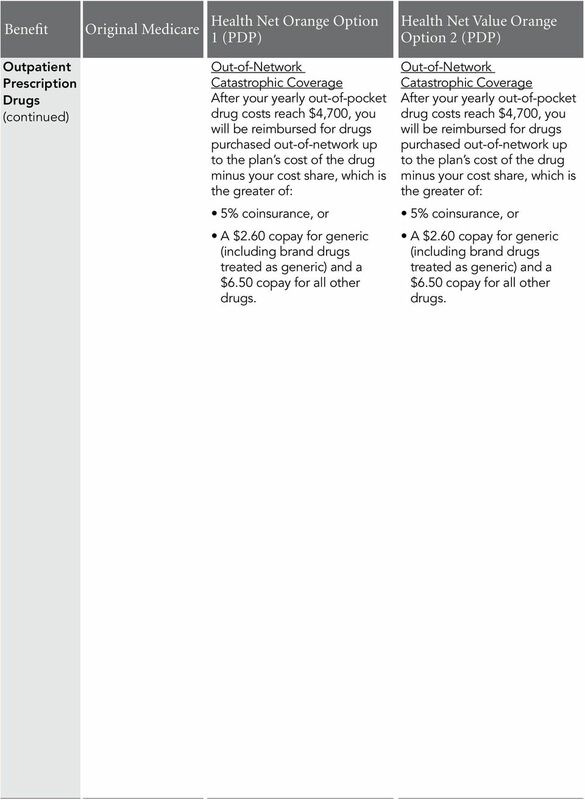 Download "2012 Summary of Benefits"
5 or change how much you pay for a drug. If we make any formulary change that limits our members ability to fill their prescriptions, we will notify the affected enrollees before the change is made. We will send a formulary to you and you can see our complete formulary on our Web site at com/formulary.htm. If you are currently taking a drug that is not on our formulary or subject to additional requirements or limits, you may be able to get a temporary supply of the drug. You can contact us to request an exception or switch to an alternative drug listed on our formulary with your physician s help. Call us to see if you can get a temporary supply of the drug or for more details about our drug transition policy. WHAT SHOULD I DO IF I HAVE OTHER INSURANCE IN ADDITION TO MEDICARE? If you have a Medigap (Medicare Supplement) policy that includes prescription drug coverage, you must contact your Medigap Issuer to let them know that you have joined a Medicare Drug Plan. If you decide to keep your current Medigap supplement policy, your Medigap Issuer will remove the prescription drug coverage portion of your policy. Call your Medigap Issuer for details. If you or your spouse has, or is able to get, employer group coverage, you should talk to your employer to find out how your benefits will be affected if you join Health Net Orange (PDP). Get this information before you decide to enroll in these plans. HOW CAN I GET EXTRA HELP WITH MY PRESCRIPTION DRUG PLAN COSTS OR GET EXTRA HELP WITH OTHER MEDICARE COSTS? You may be able to get extra help to pay for your prescription drug premiums and costs as well as get help with other Medicare costs. To see if you qualify for getting extra help, call: MEDICARE ( ). TTY/TDD users should call , 24 hours a day/7 days a week and see Programs for People with Limited Income and Resources in the publication Medicare You. The Social Security Administration at between 7 a.m. and 7 p.m., Monday through Friday. 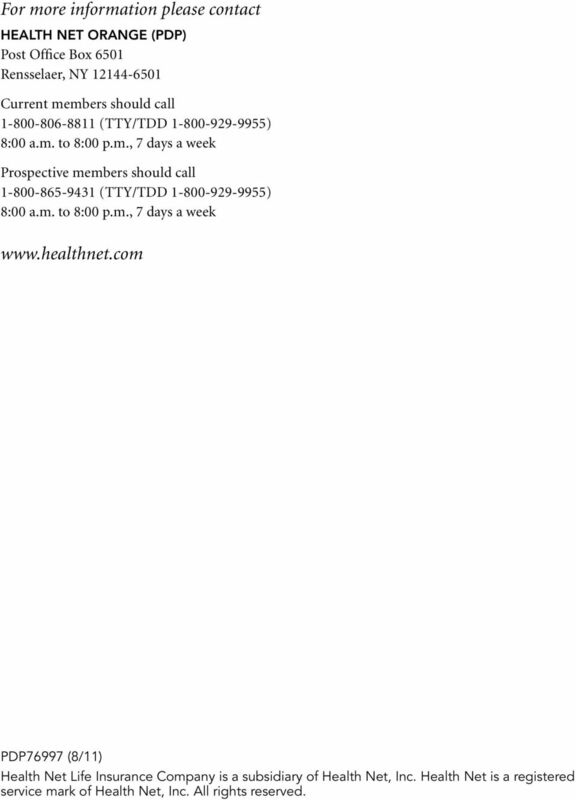 TTY/TDD users should call or Your State Medicaid Office. 6 WHAT ARE MY PROTECTIONS IN THESE PLANS? All Medicare Drug Plans agree to stay in the program for a full calendar year at a time. Plan benefits and costsharing may change from calendar year to calendar year. 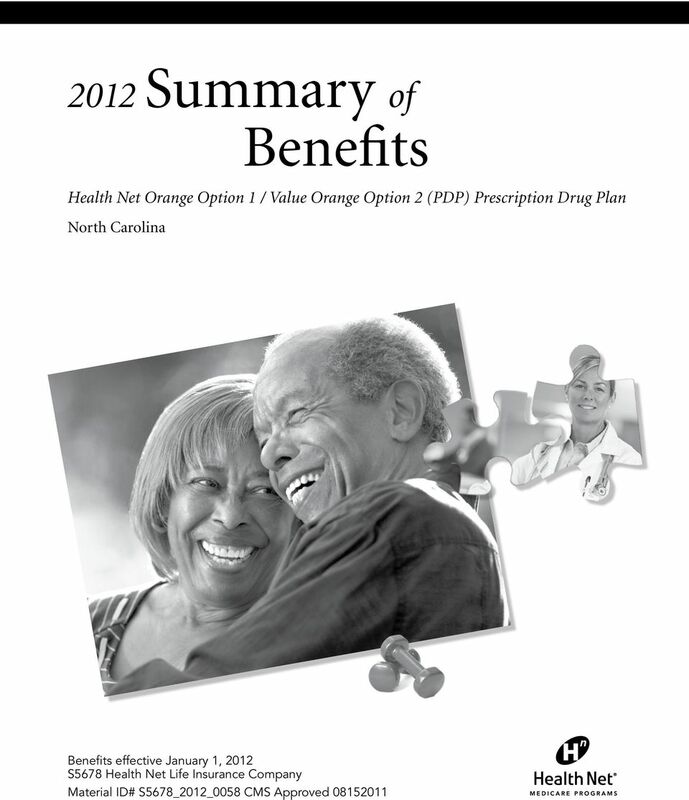 Each year, plans can decide whether to continue to participate with the Medicare Drug Plan Program. A plan may continue in their entire service area (geographic area where the plan accepts members) or choose to continue only in certain areas. Also, Medicare may decide to end a contract with a plan. Even if your Medicare Plan leaves the program, you will not lose Medicare coverage. If a plan decides not to continue for an additional calendar year, they must send you a letter at least 90 days before your coverage will end. 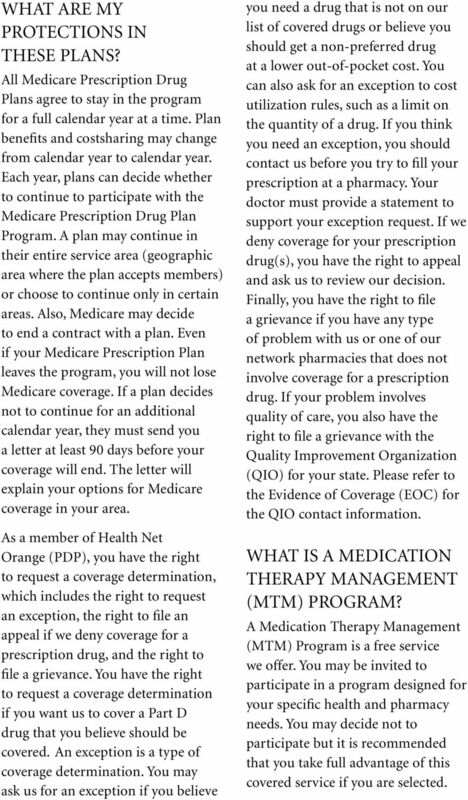 The letter will explain your options for Medicare coverage in your area. 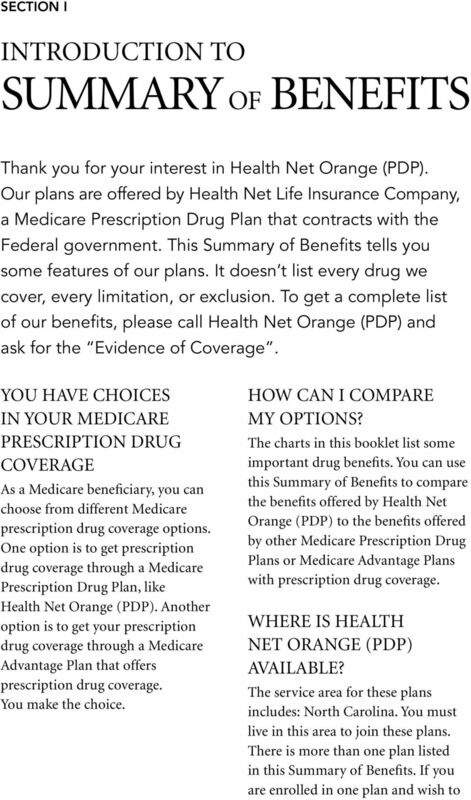 As a member of Health Net Orange (PDP), you have the right to request a coverage determination, which includes the right to request an exception, the right to file an appeal if we deny coverage for a prescription drug, and the right to file a grievance. You have the right to request a coverage determination if you want us to cover a Part D drug that you believe should be covered. An exception is a type of coverage determination. You may ask us for an exception if you believe you need a drug that is not on our list of covered drugs or believe you should get a non-preferred drug at a lower out-of-pocket cost. 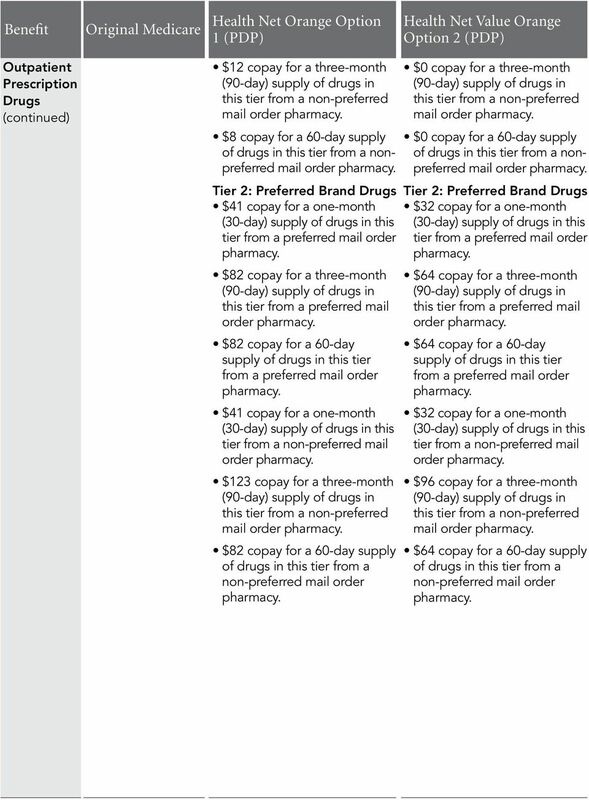 You can also ask for an exception to cost utilization rules, such as a limit on the quantity of a drug. If you think you need an exception, you should contact us before you try to fill your prescription at a Your doctor must provide a statement to support your exception request. If we deny coverage for your prescription drug(s), you have the right to appeal and ask us to review our decision. Finally, you have the right to file a grievance if you have any type of problem with us or one of our network pharmacies that does not involve coverage for a prescription drug. If your problem involves quality of care, you also have the right to file a grievance with the Quality Improvement Organization (QIO) for your state. Please refer to the Evidence of Coverage (EOC) for the QIO contact information. WHAT IS A MEDICATION THERAPY MANAGEMENT (MTM) PROGRAM? A Medication Therapy Management (MTM) Program is a free service we offer. You may be invited to participate in a program designed for your specific health and pharmacy needs. You may decide not to participate but it is recommended that you take full advantage of this covered service if you are selected. 7 Contact Health Net Orange (PDP) for more details. WHERE CAN I FIND INFORMATION ON PLAN RATINGS? The Medicare program rates how well plans perform in different categories (for example, detecting and preventing illness, ratings from patients and customer service). 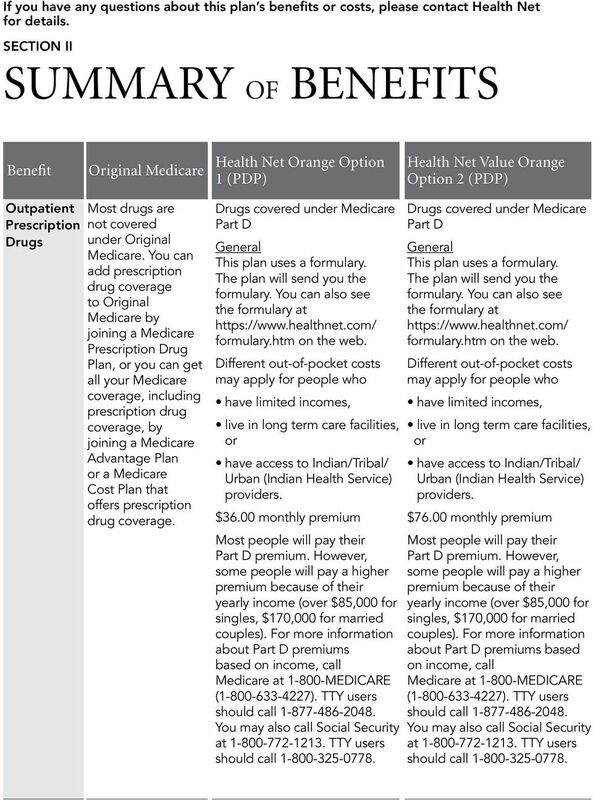 If you have access to the web, you may use the web tools on and select Health and Drug Plans then Compare Drug and Health Plans to compare the plan ratings for Medicare plans in your area. You can also call us directly to obtain a copy of the plan ratings for this plan. Our customer service number is listed below. 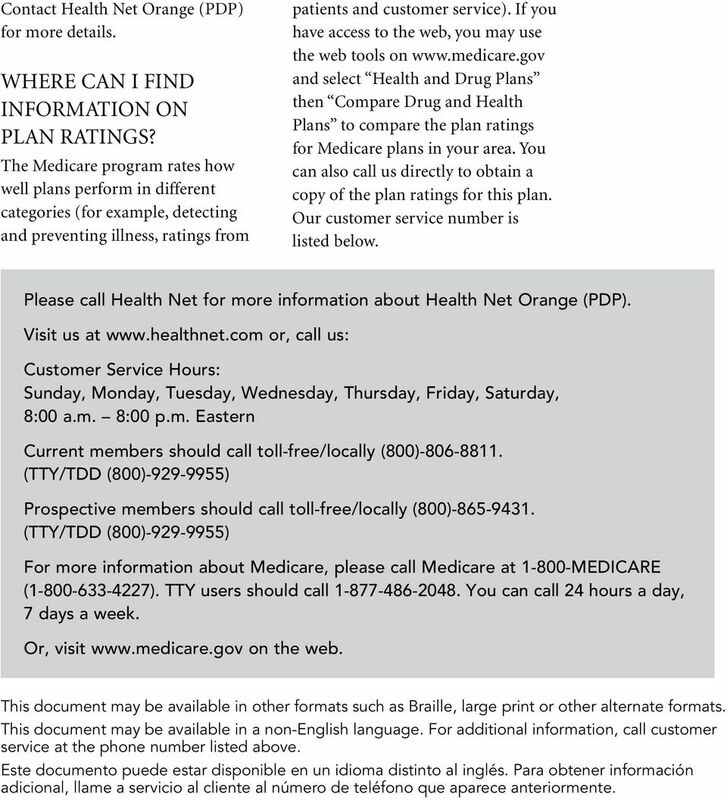 Please call Health Net for more information about Health Net Orange (PDP). Visit us at or, call us: Customer Service Hours: Sunday, Monday, Tuesday, Wednesday, Thursday, Friday, Saturday, 8:00 a.m. 8:00 p.m. Eastern Current members should call toll-free/locally (800) (TTY/TDD (800) ) Prospective members should call toll-free/locally (800) (TTY/TDD (800) ) For more information about Medicare, please call Medicare at MEDICARE ( ). TTY users should call You can call 24 hours a day, 7 days a week. Or, visit on the web. This document may be available in other formats such as Braille, large print or other alternate formats. This document may be available in a non-english language. For additional information, call customer service at the phone number listed above. Este documento puede estar disponible en un idioma distinto al inglés. Para obtener información adicional, llame a servicio al cliente al número de teléfono que aparece anteriormente. 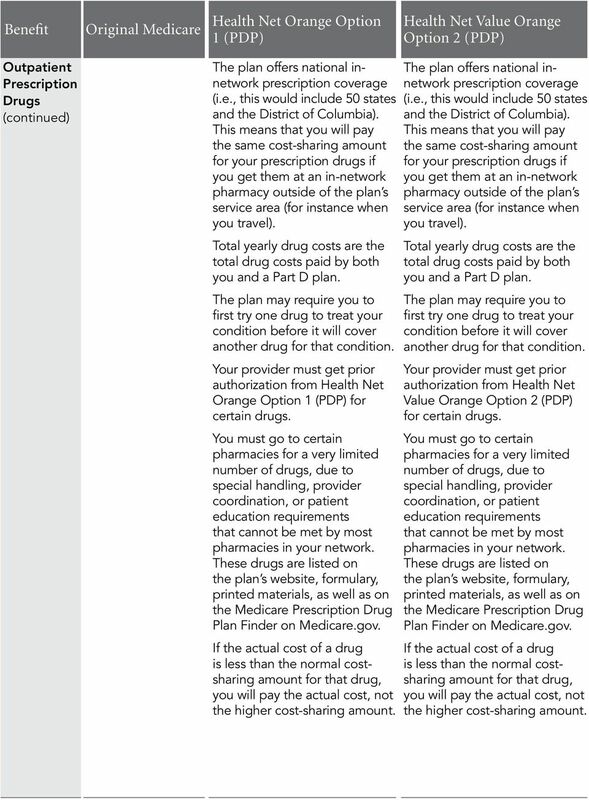 9 The plan offers national innetwork prescription coverage (i.e., this would include 50 states and the District of Columbia). This means that you will pay the same cost-sharing amount for your prescription drugs if you get them at an in-network pharmacy outside of the plan s service area (for instance when you travel). 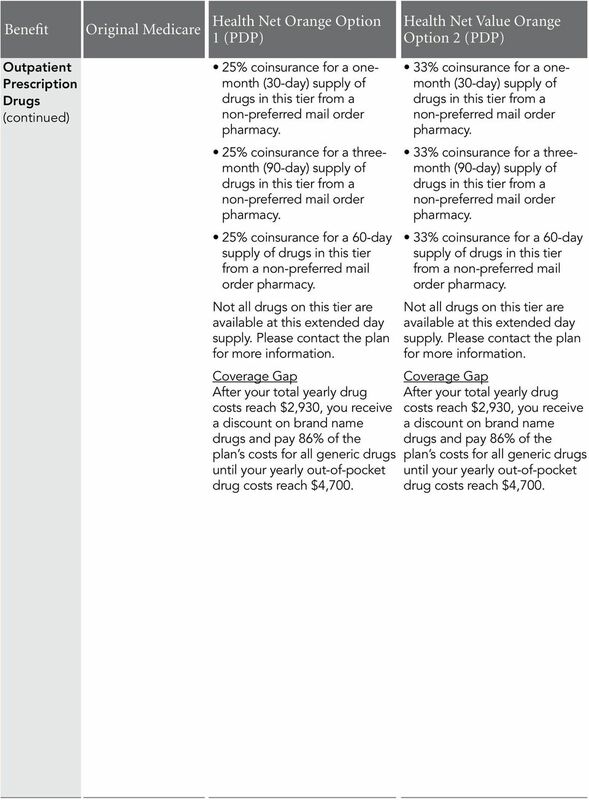 Total yearly drug costs are the total drug costs paid by both you and a Part D plan. The plan may require you to first try one drug to treat your condition before it will cover another drug for that condition. 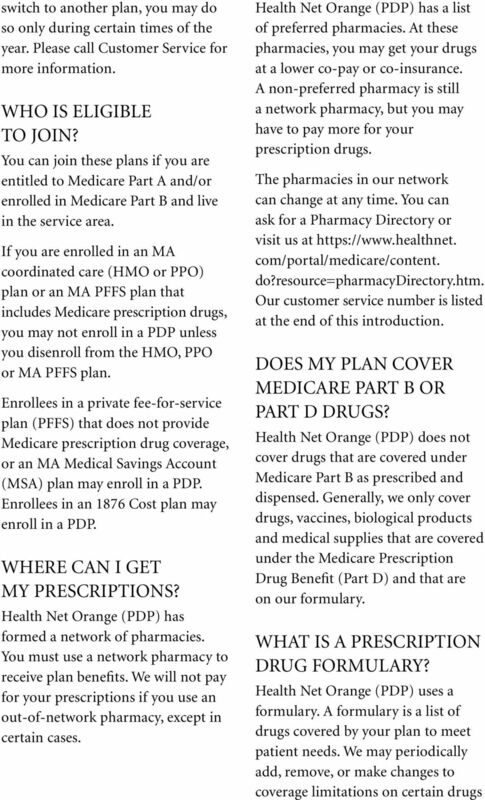 Your provider must get prior authorization from Health Net Orange Option for certain drugs. You must go to certain pharmacies for a very limited number of drugs, due to special handling, provider coordination, or patient education requirements that cannot be met by most pharmacies in your network. These drugs are listed on the plan s website, formulary, printed materials, as well as on the Medicare Drug Plan Finder on Medicare.gov. If the actual cost of a drug is less than the normal costsharing amount for that drug, you will pay the actual cost, not the higher cost-sharing amount. The plan offers national innetwork prescription coverage (i.e., this would include 50 states and the District of Columbia). 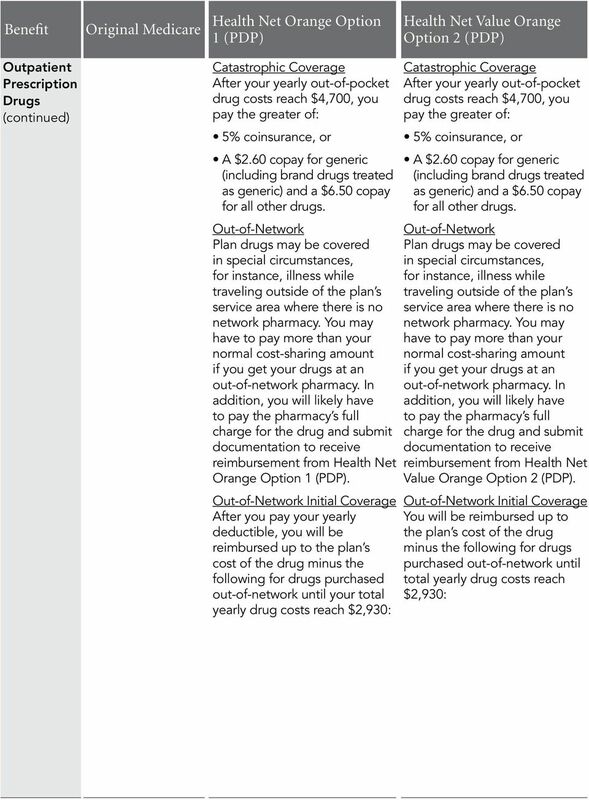 This means that you will pay the same cost-sharing amount for your prescription drugs if you get them at an in-network pharmacy outside of the plan s service area (for instance when you travel). 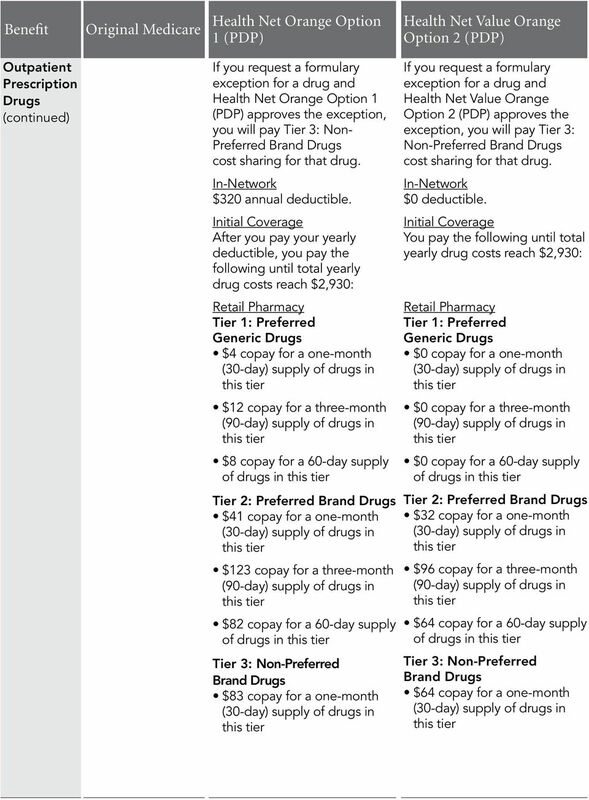 Total yearly drug costs are the total drug costs paid by both you and a Part D plan. The plan may require you to first try one drug to treat your condition before it will cover another drug for that condition. Your provider must get prior authorization from Health Net Value Orange for certain drugs. You must go to certain pharmacies for a very limited number of drugs, due to special handling, provider coordination, or patient education requirements that cannot be met by most pharmacies in your network. 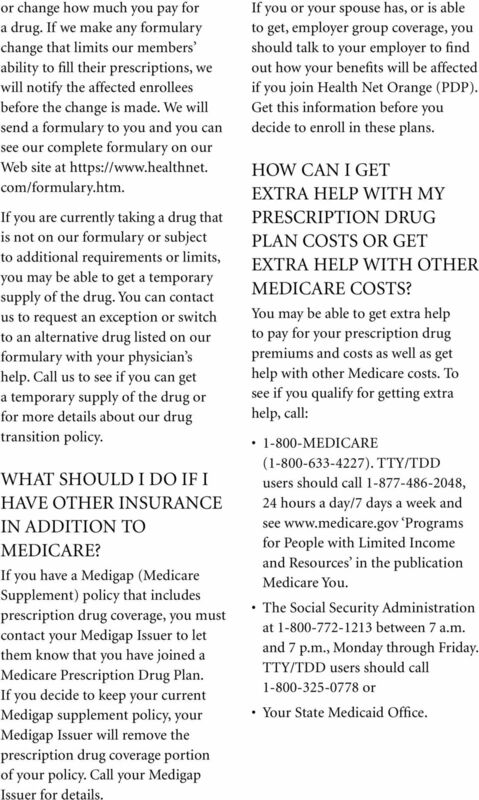 These drugs are listed on the plan s website, formulary, printed materials, as well as on the Medicare Drug Plan Finder on Medicare.gov. If the actual cost of a drug is less than the normal costsharing amount for that drug, you will pay the actual cost, not the higher cost-sharing amount. 11 $249 copay for a three-month $166 copay for a 60-day Tier: 4 Injectable 25% coinsurance for a onemonth drugs in 25% coinsurance for a threemonth (90-day) supply of drugs in 25% coinsurance for a 60-day Not all drugs on are available at this extended day supply. Please contact the plan for more information. Tier 5: Specialty Tier 25% coinsurance for a onemonth drugs in 25% coinsurance for a threemonth (90-day) supply of drugs in 25% coinsurance for a 60-day Not all drugs on are available at this extended day supply. Please contact the plan for more information. $192 copay for a three-month $128 copay for a 60-day Tier: 4 Injectable 33% coinsurance for a onemonth drugs in 33% coinsurance for a threemonth (90-day) supply of drugs in 33% coinsurance for a 60-day Not all drugs on are available at this extended day supply. Please contact the plan for more information. 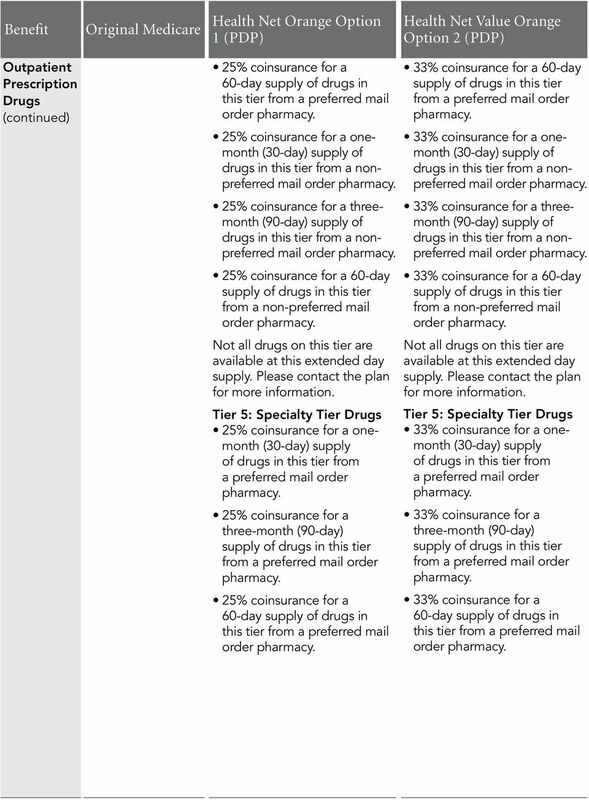 Tier 5: Specialty Tier 33% coinsurance for a onemonth drugs in 33% coinsurance for a threemonth (90-day) supply of drugs in 33% coinsurance for a 60-day Not all drugs on are available at this extended day supply. Please contact the plan for more information. 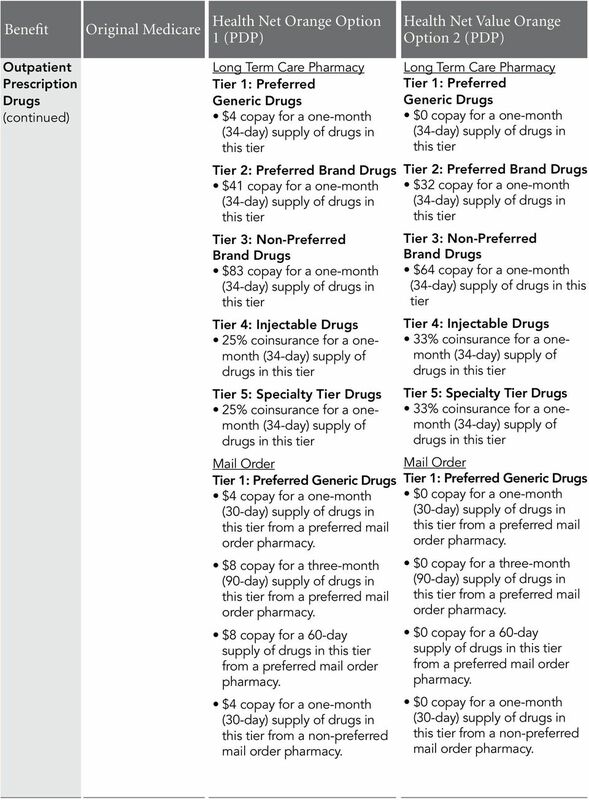 16 25% coinsurance for a onemonth drugs in from a non-preferred mail order 25% coinsurance for a threemonth (90-day) supply of drugs in from a non-preferred mail order 25% coinsurance for a 60-day from a non-preferred mail Not all drugs on are available at this extended day supply. Please contact the plan for more information. 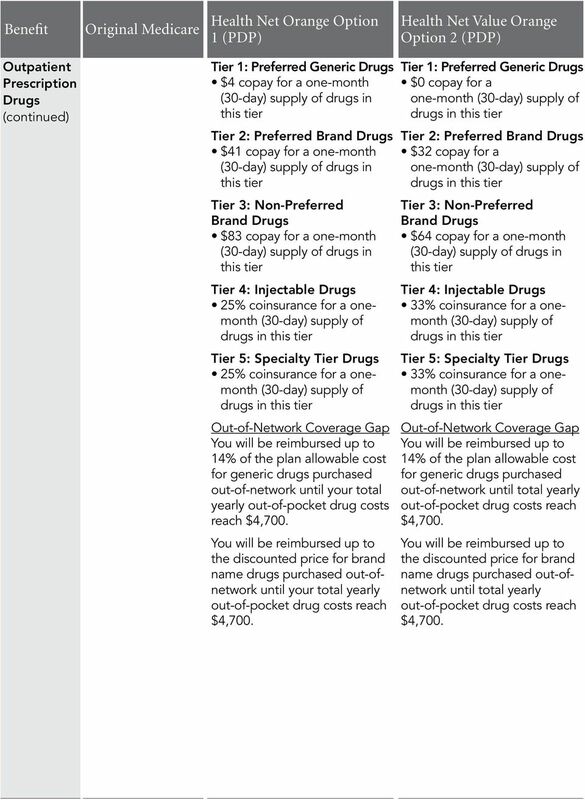 Coverage Gap After your total yearly drug costs reach $2,930, you receive a discount on brand name drugs and pay 86% of the plan s costs for all generic drugs until your yearly out-of-pocket drug costs reach $4, % coinsurance for a onemonth drugs in from a non-preferred mail order 33% coinsurance for a threemonth (90-day) supply of drugs in from a non-preferred mail order 33% coinsurance for a 60-day from a non-preferred mail Not all drugs on are available at this extended day supply. Please contact the plan for more information. Coverage Gap After your total yearly drug costs reach $2,930, you receive a discount on brand name drugs and pay 86% of the plan s costs for all generic drugs until your yearly out-of-pocket drug costs reach $4,700. 18 Tier 1: Preferred Generic $4 copay for a one-month Tier 2: Preferred Brand $41 copay for a one-month Tier 3: Non-Preferred Brand $83 copay for a one-month Tier 4: Injectable 25% coinsurance for a onemonth drugs in Tier 5: Specialty Tier 25% coinsurance for a onemonth drugs in Out-of-Network Coverage Gap You will be reimbursed up to 14% of the plan allowable cost for generic drugs purchased out-of-network until your total yearly out-of-pocket drug costs reach $4,700. You will be reimbursed up to the discounted price for brand name drugs purchased out-ofnetwork until your total yearly out-of-pocket drug costs reach $4,700. 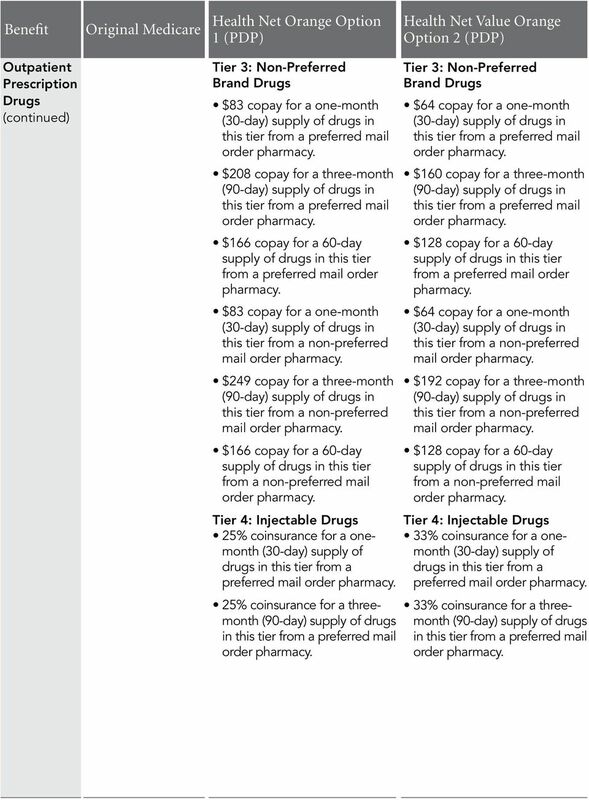 Tier 1: Preferred Generic $0 copay for a one-month drugs in Tier 2: Preferred Brand $32 copay for a one-month drugs in Tier 3: Non-Preferred Brand $64 copay for a one-month Tier 4: Injectable 33% coinsurance for a onemonth drugs in Tier 5: Specialty Tier 33% coinsurance for a onemonth drugs in Out-of-Network Coverage Gap You will be reimbursed up to 14% of the plan allowable cost for generic drugs purchased out-of-network until total yearly out-of-pocket drug costs reach $4,700. You will be reimbursed up to the discounted price for brand name drugs purchased out-ofnetwork until total yearly out-of-pocket drug costs reach $4,700. 19 Out-of-Network Catastrophic Coverage After your yearly out-of-pocket drug costs reach $4,700, you will be reimbursed for drugs purchased out-of-network up to the plan s cost of the drug minus your cost share, which is the greater of: 5% coinsurance, or A $2.60 copay for generic (including brand drugs treated as generic) and a $6.50 copay for all other drugs. Out-of-Network Catastrophic Coverage After your yearly out-of-pocket drug costs reach $4,700, you will be reimbursed for drugs purchased out-of-network up to the plan s cost of the drug minus your cost share, which is the greater of: 5% coinsurance, or A $2.60 copay for generic (including brand drugs treated as generic) and a $6.50 copay for all other drugs. 20 For more information please contact HEALTH NET ORANGE (PDP) Post Office Box 6501 Rensselaer, NY Current members should call (TTY/TDD ) 8:00 a.m. to 8:00 p.m., 7 days a week Prospective members should call (TTY/TDD ) 8:00 a.m. to 8:00 p.m., 7 days a week PDP76997 (8/11) Health Net Life Insurance Company is a subsidiary of Health Net, Inc. Health Net is a registered service mark of Health Net, Inc. All rights reserved. Y0021_H3864_MRK1948_CMS Accepted 09022013 PacificSource Community Health Plans, Inc. is an HMO/PPO plan with a Medicare contract.